Beach House, 5 Bedrooms, 3 Baths, (Sleeps 10) 180 degree ocean views. Traveling with a boisterous, lovable bunch? The Endless Summer Villa is perfect for a crowd—whether you’re part of a multigenerational family reunion or a pack of surfers on a getaway (it’s just 45 minutes from downtown San Diego to our front door, and to one of the best surf breaks around). The villa gives you the space to sprawl out, plus all the toys you need to enjoy the Baja coast, which stretches endlessly in front of our home. Kayaks, surfboards, body boards, stand-up paddle boards (SUPs) — all yours for the trip —are housed in the 3 car garage. The town of Rosarito is 10 minutes away and there’s a grocery store and restaurant just across the street. Or, wander only as far as the complex’s pool, where a local sells fresh fish and ceviche every Saturday. The complex also offers tacos, burritos and drinks in the summer. What else makes the Endless Summer Villa special? First, our family of seven—including five kids—uses this home as our own vacation spot, so we’re always checking in to update the decor and make sure everything is in good order. We love this place, and have been coming to Rosarito since we were kids ourselves. The secure complex that houses the villa, called Las Gaviotas, is safe, friendly, and knockout gorgeous, and includes the pool, a hot tub, a tennis court and more. Endless Summer Villa itself has 5 bedrooms and 3 baths, and each bedroom offers its own perks to ease any room-envy among your group. Unavoidably, the master is pretty special—with its own fireplace, ocean views, and an en suite bathroom—so you may have to flip a coin for that one. But the rest of the rooms feature elements like vibrant colors, fun local-themed artwork, televisions in every room, and high-end furniture, including indestructible wrought iron bedframes from Wesley Allen. Bright salmon-colored and turquoise Mexican tile work in the bathrooms means there’s not a drab room in the house. The living spaces all have views of the Pacific and the lofty palm trees that line the coast. The kitchen, living room, and dining room flow into one another to create one big space for your group to fill with its noise, love, laughter and food. Speaking of food—the kitchen is fully stocked with everything you’d have at home and presents the cook with sweeping views of the ocean. Every day, you’re likely to spot dolphins gliding by out in the ocean, and you may even spot a humpback or grey whale making its way along the coast. When dinner’s ready to be served, there’s a big dining table for ten indoors, or, take it outside to the ten-seat umbrella-shaded patio with restaurant-level ambiance—we’re confident in saying this space offers one of the best views in Las Gaviotas, featuring a blanket of azure water and a scattering of tall palm trees. Rosarito Beach abounds with Spanish architecture and a coastline comprised of natural cliffs that jut over tide pools teeming with marine life. You can spend all of your time on the beach or in the waves, or take a 45-minute drive to the Guadalupe Valley wine country, which is exploding in popularly thanks to its five-star restaurants helmed by French chefs and tasting vineyards that provide 95 percent of Mexico’s wines. The Endless Summer Villas has seventy positive reviews and counting, and many of our guests come back again and again. We hope you’ll come out and visit us, too. Get in touch today to let us know when you’re coming! Keywords: Las Gaviotas rentals, las gaviotas rosarito, las gaviotas baja, rosarito vacation rental, los gaviotas rentals, las gaviotas house for rent, endless summer villa, endless summer. Rental homes in Las Gaviotas. My wife and I have been going to Rosarito since we were both children. We chose to purchase this home in Las Gaviotas so that we could share the same experiences with our children that we enjoyed when we were young. We Love Baja and especially Las Gaviotas. We enjoy our role as hosts and will do everything possible to make your stay wonderful. We visit the home once a month from our residence in Southern California, ensuring that the home is constantly in great condition. We have a lot of pride in the home which you will see upon your arrival. Las Gaviotas provides an increadible international beach vacation getaway. This is the perfect location with a dry, warm climate and only 30 minutes from San Diego. We enjoy excellent surf all year and feel very secure in this gated, guarded community. We have great dining, dancing, live music and shopping just a few mnutes away. 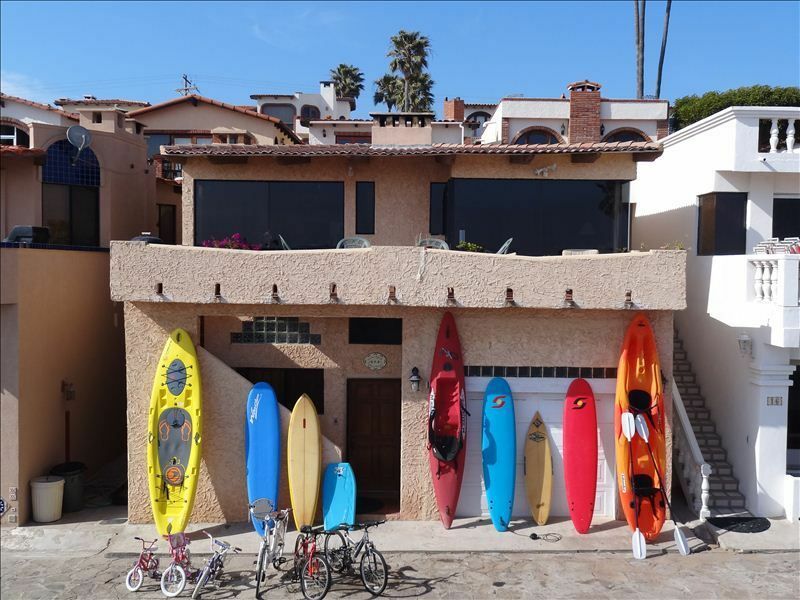 This is the only home in Las Gaviotas with a dinning room table that seats 10 and a garage full of kayaks, surfboards and bicycles. You can walk to the restaurant across the street for great food and music. There is a grocery store across the street as well. You don't have to drive a car during your stay here. Surfers love this place with a great uncrowded break all year long. Golfers enjoy convenient access to two wonderful courses. Sun worshipers enjoy taking in the sun and the view on the huge balcony. Those looking for pure relaxation enjoy sitting on the decks or on the beach. Families love the community feeling and the security and kids love the beach and the pool. toilet, combination tub/shower, Two sinks. Please bring your own beach/pool towels. Surfboards, kayaks, stand-up paddle boards, boogie boards, beach toys, beach chairs. The only home in Las Gaviotas with these items available for your use. The only home in Las Gaviotas with a table that seats 10 persons next to a bar area that seats 4 more. A two man kayak and a one man kayak available in the garage. Surfboards and stand-up paddle boards available in the garage. Community tennis court. Reserve times at the guard house. Large dinning room table that seats 10. Surfboards, kayaks, stand-up paddle boards, boogie boards, wetsuits located in the three car garage. Amazing house and great hosts! Very responsive and kind family. The house was clean and full of fun toys for the ocean! Great rental house with incredible views from the 2nd story patio! This was my 2nd stay at the Endless Summer Villa and I absolutely loved it - again. Clean and spacious, with a large windows looking out over the las gaviotas community onto the pacific ocean. Mark is very easy to communicate with and had no problems checking in or out. The bedrooms are all a good size and the large living room was great for a group of our size. I would stay here again in a heart beat... hopefully sooner rather than later!! Another awesome time at the Endless Summer Villa! My sons soccer team really enjoyed their first experience in Mexico! Las Gaviotas was the call! We booked this trip for family and friends to celebrate my husbands birthday (8 adults and a 1yr old). Everything was exactly as described and the views were phenomenal. We actually saw a whale one morning and dolphins the next right from the balcony! The pool, jacuzzi, beach and surfing were all within a very short walk and we were able to use Mark and Antoinette's boards from their garage for those of us that don't surf. Mark and Antoinette were very accommodating and quick to respond to questions (less than 30min in most cases). We will definitely be staying here again. Thanks Mark and Antoinette! Beautiful, dreamy sunsets this week! My family and I just finished a week long stay at the endless summer house. We had 4 adults and 4 toddlers and had plenty of space. There were great gathering spaces, but also great separation spaces for sleep and privacy. The house had a wonderful authentic Mexico style, which we loved because it gave us a break from Orange County and let us feel more part of the culture we were staying in. The community felt very safe, which was important to my friends and family. We ventured out a few times and had some local food, which was also amazing. The house had everything we needed and more. We'll definitely be coming back! The surfing at Las Gaviotas is considered one of the best surf breaks in Northern Baja and Southern California. The peak breaks both right and left. There is never a crowd at Las Gaviotas since it has a private beach. Christmas, Easter and Bike Race weekends have a 3 night min at $450 a night. Memorial Day, 4th of July, Labor Day, Thanksgiving and New Years weekends have a 4 night min at $450 per night. Summer dates have a 4 night minimum over weekends.